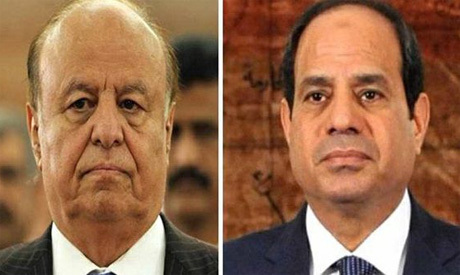 Egyptian President Abdel-Fattah El-Sisi spoke by phone late on Wednesday with Yemeni President Abd-Rabbu Mansour Hadi where they discussed the United Nations efforts to end the war in Yemen, El-Sisi's spokesman said. The two leaders discussed the latest developments in Yemen, most notably the UN-sponsored peace talks between warring parties in the country, presidency spokesman Bassam Rady said in a statement on Facebook. “El-Sisi emphasised Egypt's commitment to supporting the political solution in Yemen within a framework that seeks to preserve the unity and stability of Yemen and its legitimate government,” Rady said. The United Nations is sponsoring efforts to end the nearly four-year-old conflict in Yemen under a peace plan that calls for a ceasefire between the Saudi-led coalition and Iranian-aligned Houthis, as well as the formation of a transitional governance deal. During the call, the two leaders agreed on the need to avert any attempt to circumvent the political course to solve the Yemeni crisis and agreed to continue future coordination to provide support and humanitarian assistance to Yemen.